Killer cool Feeler! Wish I had bought two like the rest of You :"). I got CF and love it but man that black coating really emphasizes how wicked and pointy it is. Woohoo!!!! Shipping notice. It should arrive monday! Apocalyps, MattinLA, Chingon1988 and 8 others like this. Got mine today, Green & Black G-10 with Black blade! I knew it would be cool, but damn I like this Silent Knight! 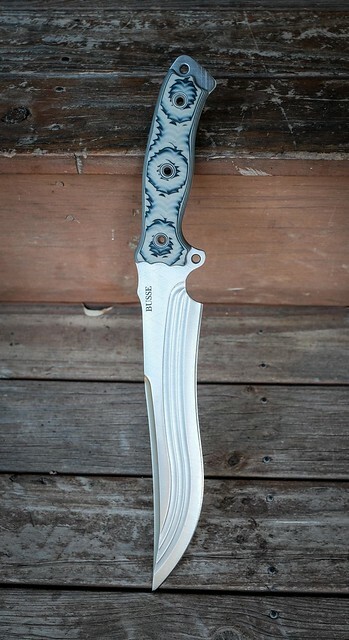 I got a Blue & Black G-10 with black blade for my "brother". But I'm sure you're all as excited as I am in how these big ol blades turned out! Lex, that's a mean looking blade! That's how I ordered the Forsaken TG, as per MurMans recommendation! So much more to come this year!! Well, best wishes all y'all! Looks amazing. Have same combo coming sans catch. Got shipping notice today!!! lex2006 and 6850 like this. Thanks jack, its midnight blue by the way! Has anyone used theirs yet? It looks like it would be a heck of a meat slicer. I'm not going to subject mine to the abuse that my Battle Grade Fusion Battle Mistress is receiving chopping wood and dismantling old doghouses in the back yard for my amusement. The midnight blue finish on mine really is amazing so I'll keep it ready for zombies, pirates and ninjas. CookieRawwr and Midwest Firecraft like this. Really enjoying the blade, handle feels great. Really clean comp finish IMO. Apocalyps, CookieRawwr, Leonardo63 and 4 others like this. 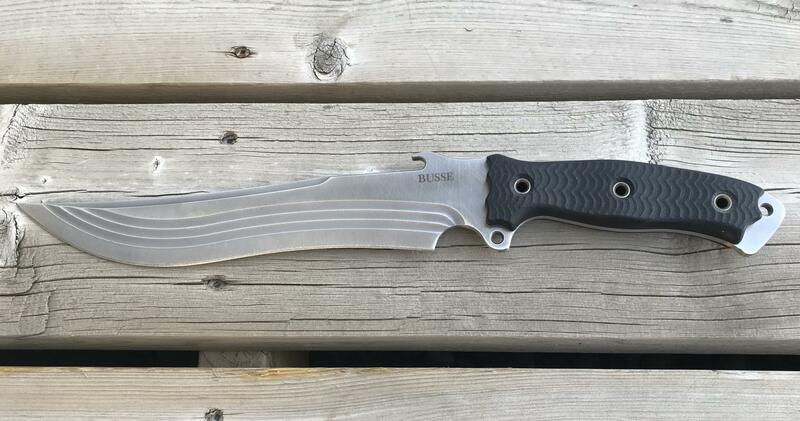 This is my first Competition Finish blade and I didn't really know what to expect, but I think it is safe to say it is my new favorite finish. The light machine marks really go well with the cbt. I can't say enough about the light quick handling of this blade. I have never held a knife that felt so alive in hand. Love the smooth canvas handle as well. This one is a keeper. Apocalyps, Crosier, CookieRawwr and 4 others like this. put another point up for the non-catch version! Beautiful blades all around! 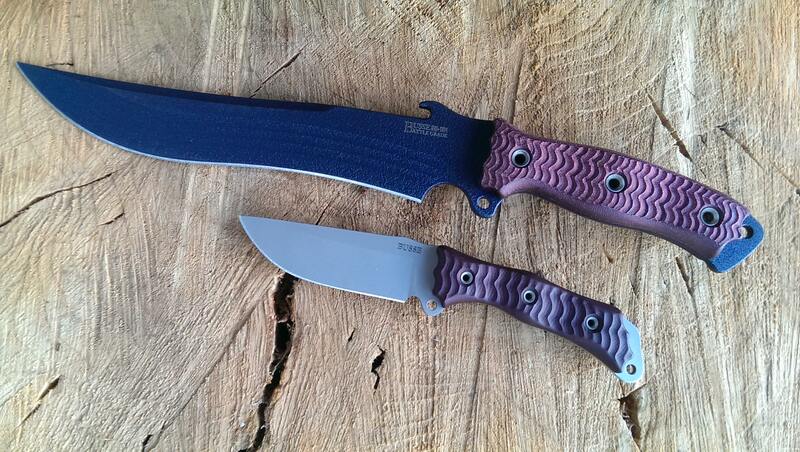 These really are very, very cool knives and very well designed and executed. To even feel the "heft" you have to mess around with a skinny ASH, etc and then grab this one. It is no lightweight! Beauties! Man, I love that shot @Crosier- super sweet pairing! Those are great pics that really show it off. I agree, you have to handle another blade to feel it has some weight but for it's size, it's a lot like the Burp, feels really light. Those 2 are the best pairing. My arrived a couple of days ago. As life would have it I’ve been assisting an ailing parent so I’ve just now been able to open her. First impressions aren’t particularly good. I’m not shot thru the heart with the comp finish. There are a lot more tooling marks/scratches than anticipated, particularly for a knife at this price point. I’ll have to fondle it for a bit but this one may hit the market. I received mine the other day and couldn't believe how light, quick, & snappy it felt in hand. It really is light & fast for such a large blade. Feels really awesome in hand. Really am happy with my CF SK w/Green Micarta. I know a lot of the hogs like fat infi but I'm not a fan. 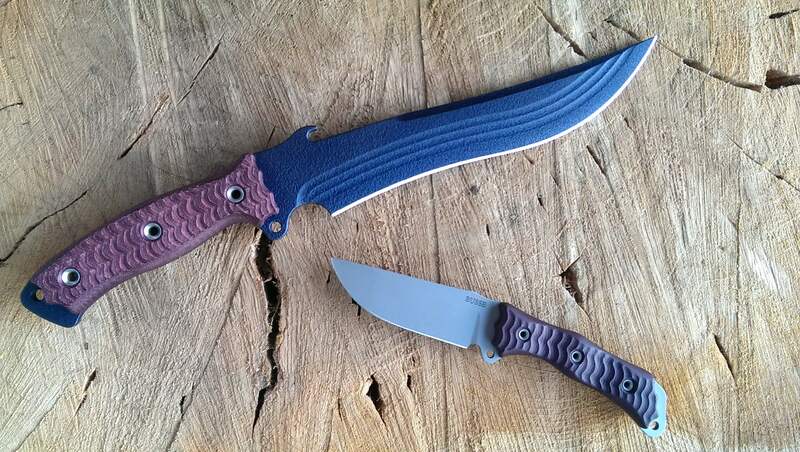 This wouldn't be the same knife at 1/4 inch or more. At just under 7/32 it is so lively and balanced, it is amazing. 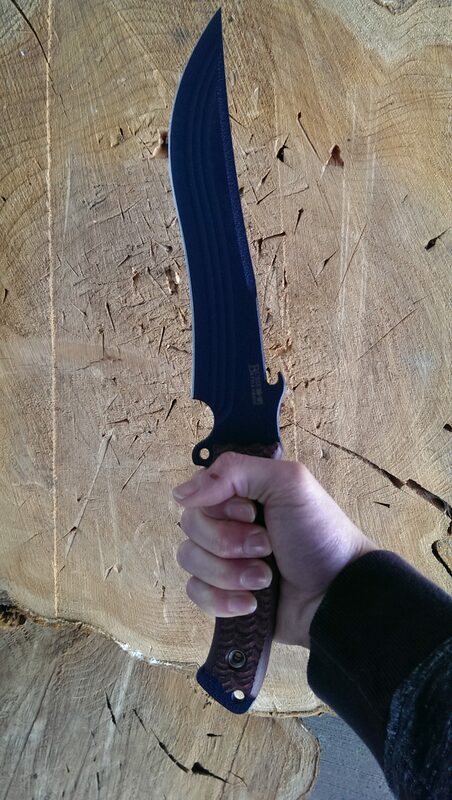 I'm not a big knife guy, but at 1.2 pounds, it is lighter than my outdoor axe. I'm going to bring it on my spring BWCA trip and see how she does. I love the competition finish, as long as the decarb has been removed and rust won't be an issue, it is my new favorite finish. First impressions aren’t particularly good. I’m not shot thru the heart with the comp finish. There are a lot more tooling marks/scratches than anticipated, particularly for a knife at this price point. I’ll have to fondle it for a bit but this one may hit the market. I can see how some people are not impressed because the stock photo doesn't really show many tooling marks and even though the description mentions it, "a picture is worth a thousand words." That having been said I am very grateful that it wasn't offered in satin only for $200-$400 more. I actually thought the price point was spot on for this knife. A great thing about the free market, some of us like it, some of us hate it, but I sure do love the options! I just got my Silent Knight CF w/ catch. This is my first CF and is easily my new favorite finish. Hey thanks my friend. I have envisioned pairing these since I first got the BURP and they are as amazing together as I thought. One of the biggest reasons I went no catch. I planned on them as a set so hard that I already had custom sheaths ordered from DB with the same theme so they could be a "set". Can't wait! Got mine during the week, while I like the old CF I don't mind this one either. I'll have to get some of my CF TGLB's out to compare later. Here's my CF Silent Knight, Black & Tan G10 with blade catch removed. T90, Leonardo63, Dadpool and 4 others like this.